• Working knowledge of computer like ERP, MS Office, Usage of Internet etc. is essential for said posts. • Method of Selection: Through Personal Interview for posts at S.No 1 & 2 and Written Test+ Group Discussion for posts at S.No. 3,4 & 5 to be held at NHDC LTD, Greater Noida. • Outstation candidates called for interview will be eligible for To & Fro rail fare by shortest route on production of proof of journey. For Post at S.No. 1 (AC 2 tier), posts at S.No.2 & 3 (AC 3 tier) and posts at S.No. 4 & 5 (Sleeper Class). • Application Fee: Rs.300/- to be remitted using Online payment options (Debit Card/Credit Card/Internet Banking) through the Online Application facility, which can be accessed through our website www.nhdc.org.in (Career Page) from 08.10.2018 to 07.11.2018 No other mode of payment is acceptable. 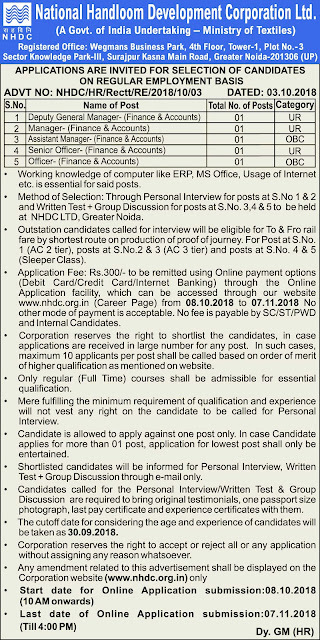 No fee is payable by SC/ST/PWD and Internal Candidates.